Ryon Bingham is a former professional football defensive tackle with the San Diego Chargers. He was drafted in the seventh round of the 2004 National Football League draft. 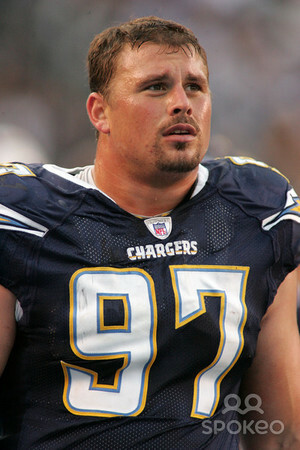 Bingham recovered from several painful injuries while playing for the Chargers, including tearing both biceps off the bone, blowing out both knees, and experiencing heart problems during a game. He was released in September 2010. Bingham was born on June 6, 1981, in Salt Lake City, Utah. During high school he was a two-time class 5A heavyweight wrestling champion and offensive tackle and nose guard on the Alta Hawk’s team. He was named the Gatorade Player of the Year, the Salt Lake Tribune Player of the Year, the Utah Player of the Year, and earned All-State honors. He earned a degree in criminal justice at the University of Nebraska, where he also lettered in football. During his senior year, he was an All-Big 12 Conference selection. He had previously been an honorable mention All-Big 12 Conference selection and second-team All-Big 12 honoree. Bingham broke the navicular bone in his foot in 2000, and it took almost a year for it to heal fully. It was during this difficult time that he returned to his religious roots—he had been baptized a member of The Church of Jesus Christ of Latter-day Saints when he was eight years old, but left activity a few years later when his parents divorced. When missionaries knocked on his door, he at first slammed the door in their faces, then reconsidered and let them come in and teach him. Bingham and his wife, Danie, are the parents of two children and live in Utah. This page was last edited on 1 October 2015, at 18:03.